Located near the northwest tip of Aruba and the popular Arashi Beach, California Lighthouse is a landmark on this small tropical island. Known for impressive views of the Caribbean Sea, as well as the nighttime stars, the lighthouse is one of the most photogenic spots in Aruba. Built between 1914 and 1916 and named after the S.S. California, the lighthouse is open to the public, allowing visitors to climb to its highest lookout point and take in panoramic views. There's also a small Italian restaurant located in the base of the lighthouse that has earned rave reviews. Daily tours of the lighthouse last 25 to 30 minutes, and many sightseeing tours include it on their routes. You can also visit the lighthouse on a variety of island tours, including those via Jeep, ATV, and Segway. Children aged four years and younger are admitted free. V.I.P. tours can be booked for anytime between 5:30pm and 8am for a midnight, sunset, or sunrise viewing. The adjacent California Sand Dunes are a popular spot where kids like to slide down the slopes. The California Lighthouse is located at the north end of L.G. Smith Boulevard in Noord, Aruba, in a section known as Hudishibana. From the Aruba Cruise Terminal, it’s roughly a 20-minute drive to the lighthouse; simply follow L. G. Smith Boulevard north. The lighthouse is also accessible via taxi or tour bus. The California Lighthouse is arguably the best place to catch the sunset on Aruba, which also means it can be crowded at that time. The lighthouse is open from 8:30am to 11:30pm daily. It’s also possible to book V.I.P. tours anytime between 5:30pm and 8am for a midnight, sunset, or sunrise viewing. Located about 20 minutes south, on the eastern side of the island, the Alto Vista Chapel, or “Pilgrims Church,” is another photographer’s dream. Built by Spanish missionaries in 1750, the bright yellow chapel hosts services as well as tour groups. Outside the chapel lies the “peace labyrinth,” which is used by pilgrims for prayer and meditation. Ride a UTV through Aruba's rugged landscape during this 3.5-hour adventure. Meet your local adventure guides and take off to see sights like the Wish Rock Garden, the Baby Bridge, Black Stone Beach, the California Lighthouse and the Bushiribana Gold Mine Ruins. Enjoy engaging, informative commentary during your tour and make a beach stop for a refreshing swim. Use of safety gear and round-trip transportation from Aruba hotels are included. Explore the highlights of Aruba behind the wheel of a 4x4 jeep during this 4.5-hour activity. Go off-road on the wild side of the island and get up close to several sights that are not accessible to traditional vehicles. Visit the California Lighthouse, the Natural Bridge, the Bushiribana gold mine ruins, the Ayo and Casibari rock formations, and the Alto Vista Chapel. Learn about Aruban culture and history from your local guide as you follow them around the island. Refreshments and round-trip transportation from Aruba hotels are included. 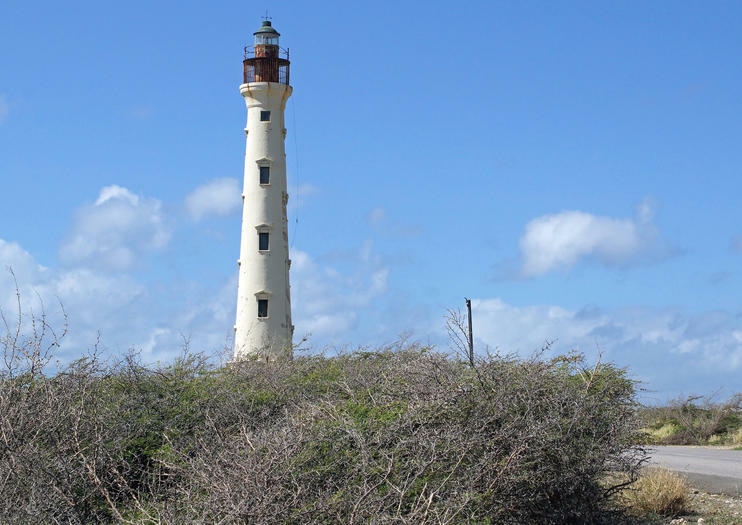 Explore the area around California Lighthouse riding on a Segway X2 during this 2-hour activity in Aruba. Get up close to this recently restored historical landmark, dating from 1914, while enjoying insightful commentary from your local guide. Traverse the unusual landscape around the lighthouse, perched high above the coastline, and be on the lookout for herds of wild goats. All equipment, refreshments and round-trip transportation from Aruba hotels are included. Explore the highlights of Aruba behind the wheel of a 4x4 jeep during this 8-hour activity. Go off-road on the wild side of the island and get up close to several sights that are not accessible to traditional vehicles. Visit the California Lighthouse, the Natural Bridge, Frenchman's Pass and the Ayo Monolithic Rock Formation. Learn about Aruban culture and history from your local guide as you follow them around the island. Eat lunch at a local barbecue restaurant and relax in the sun and sand at Baby Beach. Explore Aruba's highlights on this 6.5-hour sightseeing tour. Snorkel at Baby Beach, visit Ayo Rock Formation and Lourdes Grotto. Learn about the culture and history of Aruba from your local guide as you criss-cross the island. Snacks, lunch, soft drinks, snorkel equipment and round-trip transportation from your hotel are included. Maximize your time on Aruba on this sightseeing tour that takes you to many of the island's top sights by bus. Although it is an informative tour, filled with insights into local history and culture, there's also time for dancing to carnival songs and snorkeling and soaking up the sun on one of the island's best beaches. When your cruise ship docks in Aruba, spend your time in port zooming around the island during this 3-hour ATV adventure. Use of a helmet, ATV, and instruction provided, no experience necessary. Drivers must be 18 with a valid driving license. Go off-roading on the North Coast of Aruba, considered one of the island's hidden treasures, during this 4.5-hour eco-tour. With a local adventure guide, visit rugged landscapes bordered by the restless waves of the azure ocean. Get fantastic photos of the breathtaking panoramas on the island's windward side like Bushiribana Gold Mill Ruins, Wish, Garden, Natural Bridge, Blackstone Beach and Twin Bridges. Round-trip transportation from Aruba hotels is included. Go for a ride in the Aruban countryside in your personal Utility Terrain Vehicle (UTV) during this half-day, guided, off-roading tour. Learn to drive your UTV and ride on your own or in pairs to sights around the island like the Bushiribana Gold Mills Ruins and Black Stone Beach. At the last stop, Arashi Beach, enjoy a swim in paradise. See Aruba from coast to gorgeous coast on this 4.5-hour. Visit highlights such as the Natural Bridge Ruins and the Cunucu houses, as well as the unusual rock formations in the island's interior. Hotel pickup and drop-off, as well as refreshments and snacks, are included.